Who doesn’t like a comforting soup on a chilly winter day? This Cream of Vegetable Soup is like a vitamin explosion for your body due to the vegetables it contains. I use great winter vegetables in this soup like leek, carrot, celeriac and cabbage, which are suggested to strengthen immune system. This is a very tasty and heartwarming soup with lots of vitamins in it. What’s more, it’s gluten-free! I guarantee it will become one of your favorite soups in winter. 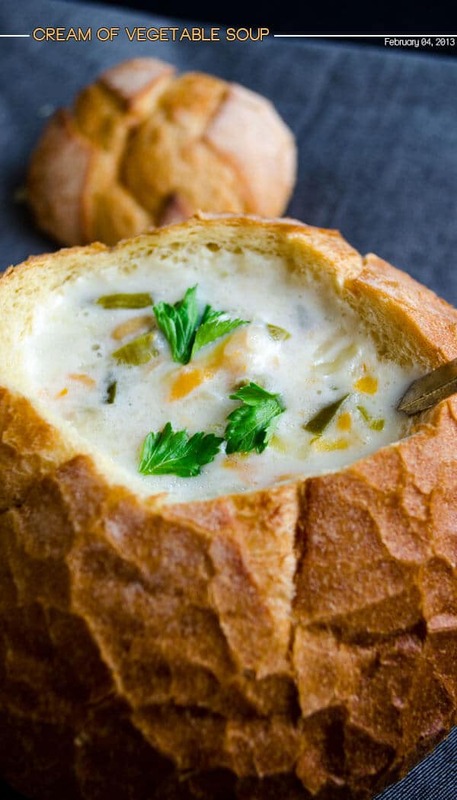 It’s very easy to make this cream of vegetable soup. What you need to do is just to grate and chop vegetables, boil them and pour a mixture of milk and rice flour into the pot. Add butter and boiled chickpeas as a final step and stir occasionally. That’s it! Grate a potato and a carrot directly into a deep pot. Potato helps the soup get the right consistency due to the starch it contains. Carrot gives a bit sweetness and add a nice orange color in the soup. Chop leek and a little cabbage finely. The strong flavor of leek softens as it’s cooked and it gives a nice onion like flavor. White cabbage makes the soup even more suitable for the season. Cabbage pieces are almost invisible in the soup, but they balance the flavors in the soup perfectly with their sweetness. I use very little celeriac in the soup as I don’t want its earthy flavor to supress other flavors. Just 2 tablespoons of grated celeriac is fine for my cream of vegetable soup. So put all these in a deep pot, add water and boil until tender. This is a cream of vegetable soup without cream.Well, I use milk and rice flour mixture instead and it’s still so yummy with the right thickness. I think this mixture makes the same effect as cream. Soups in Turkish cuisine mostly contain all purpose flour to give them a bit thickness, but I use rice flour for this one to make it gluten-free. No difference in taste at all! A heartwarming gluten-free cream of vegetables soup without cream. Put the vegetables in a deep pot. Pour water in it and boil until the vegetables are tender. Mix milk and rice flour well and pour it into the pot when the veggies are tender enough. Boil it for about 10 minutes over medium low heat, stirring occasionally. Add salt and butter and stir. Garnish with celeriac leaves and serve warm.